This training allows women who need skill development to learn basic sewing and tailoring. This 40 week course enables each woman to have a portfolio demonstrating her abilities and teaches her how to operate a treadle sewing machine. This portfolio enables them to approach potential employers or clients with a demonstration of their sewing and tailoring proficiency. 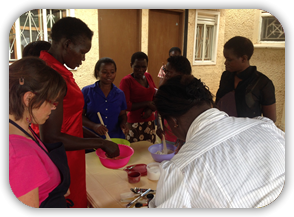 We discovered that baking and catering is a lucrative business opportunity for Ugandan women. It has the potential for both an individual business or a group business. This training provides basic cake making, dough proofing, decorating, bakery setup, accounting, marketing skills, food sanitation requirements, and an essentials baker's tool kit. Upon completion of the sewing and tailoring training each woman will need her own treadle sewing machine in order for her business to get up and running. These sewing machines enable her to work from home while still caring for her children. With just $100 we can purchase her a machine, which otherwise would be financially out of her reach. 12-15 women would like to join together to form a commercial bakery. A business like this will provide daily income stability for more than 70 women and their children. Electricity and propane are cost prohibitive for these marginalized women. 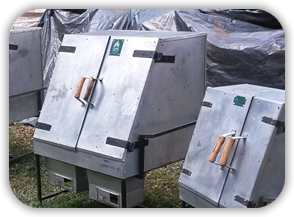 Therefore, they are in desperate need of three charcoal ovens in order for their business to thrive. Each oven will cost $240. 98% of every dollar given to Sisters of Hope International goes directly to empower vulnerable women with income-generating opportunities in Gulu, Kampala, and Masaka. Not sure where to invest? Feel free to donate to the general fund and we will ensure your resources make a difference in the lives of these women. NOTE: All US staff are volunteers.